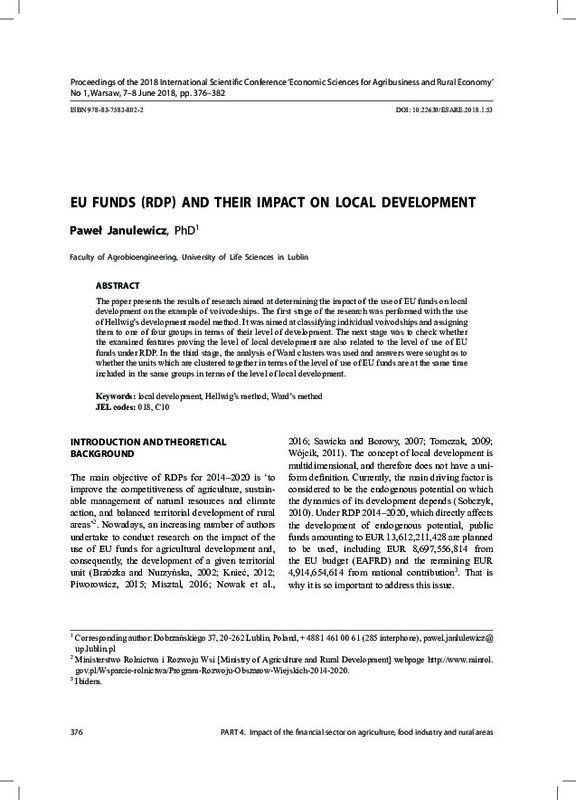 The paper presents the results of research aimed at determining the impact of the use of EU funds on local development on the example of voivodeships. The first stage of the research was performed with the use of Hellwig’s development model method. It was aimed at classifying individual voivodships and assigning them to one of four groups in terms of their level of development. The next stage was to check whether the examined features proving the level of local development are also related to the level of use of EU funds under RDP. In the third stage, the analysis of Ward clusters was used and answers were sought as to whether the units which are clustered together in terms of the level of use of EU funds are at the same time included in the same groups in terms of the level of local development.